This is the twentieth weekly installment featuring highlights from the 20 chapters in the new book, Deaf Eyes on Interpreting, edited by Thomas K. Holcomb and David H. Smith, which was released in June by Gallaudet University Press. Making connections is a critical aspect of Deaf culture. 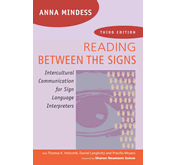 In this chapter, Naomi Sheneman states that if interpreters do not incorporate certain cultural conventions, like introducing themselves in a culturally appropriate manner before beginning their interpreting work, they send a message that they do not understand or respect Deaf culture. Consequently, Deaf people may have trouble trusting them. What is necessary is to specify their first name, last name, and the name of the agency that sent them. This is to make it easy for Deaf consumers to provide feedback. Ignoring this custom perpetuates the conduit model and promotes a growing disconnect between the Deaf and interpreting communities. If interpreters cannot begin by introducing themselves properly, Deaf people would worry whether they are capable of facilitating cross-cultural communication. Sheneman calls on interpreter educators to educate future interpreters on ways to build a stronger connection with the Deaf community, including making culturally appropriate introductions. Posted in Deaf Culture, Deaf Culture in Action, Deaf Culture Values, Deaf Eyes on Interpreting, Deaf/hearing cultural differences, interpreters, videos from book contributors and tagged ASL interpreters, Deaf cultural conventions, Deaf Culture, Deaf Eyes on Interpreting, Introductions, Naomi Sheneman, politeness, trust between Deaf people and interpreters. Bookmark the permalink. This is the sixteenth weekly installment featuring highlights from the 20 chapters in the new book, Deaf Eyes on Interpreting, edited by Thomas K. Holcomb and David H. Smith which was released in June by Gallaudet University Press. Perhaps the most critical area, where it is vitally important that an interpreter’s skills match the Deaf consumer’s needs, is in the health care field. This chapter, “Community Health Care Interpreting,” was co-written by Cynthia Plue, Lewis Lummer, Susan Gonzales, and Marta Ordaz. As described by Plue in the video above, attention must be paid to four key competency areas in order to meet the diverse needs of various segments of the evolving Deaf community. These include competency and clarity in communication, language proficiency, cultural competency, and healthcare literacy. Especially important is the ability to meet the needs of Deaf individuals with limited language and/or educational backgrounds, as well as those who are Deaf blind. For these individuals, the authors encourage the use of certified Deaf interpreters to ensure successful delivery of critical healthcare information. Another solution Plue suggests is the use of a chart to outline the communication, language, literacy needs and preferences of each Deaf patient to minimize a potentially life-threatening mismatch. Posted in Deaf Eyes on Interpreting, Deaf Interpreters, health care interpreting, interpreters, medical interpreting, New book, Deaf Eyes on Interpreting, videos from book contributors and tagged ASL interpreters, Cynthia Plue, Deaf Eyes on Interpreting, Deaf interpreters, health care interpreting, Lewis Lummer, Marta Ordaz, medical interpreting, Susan Gonzales. Bookmark the permalink. This is the twelfth weekly installment featuring highlights from the 20 chapters in the new book, Deaf Eyes on Interpreting, edited by Thomas K. Holcomb and David H. Smith which was released in June by Gallaudet University Press. In this chapter, Thomas K. Holcomb makes a case for a stronger and closer relationship between Deaf Academics and the interpreters who perform ASL to Spoken English interpreting work for them. His point is that “just trusting” that an interpreter will do a excellent job is not enough. In a similar fashion to trusting a mechanic to work on your car or a dentist to work on your teeth, consumers need some kind of verification that the job is being done well. In the case of interpreters, it is difficult for the Deaf academic to verify the quality of interpreters’ performance without direct observation. Holcomb shares his experience of having a transliterator work in his classroom to provide him with direct signed translation of the interpreters’ ASL to Spoken English interpretation of his lectures. He insists that such solutions need to be pursued in order to promote genuine trust among Deaf Academics in the work the interpreters do on their behalf. 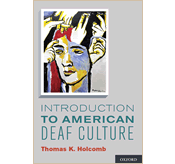 Posted in Deaf academics, Deaf Eyes on Interpreting, interpreters, New book, New book, Deaf Eyes on Interpreting, videos from book contributors and tagged ASL interpreters, Deaf academics, Thomas K. Holcomb, Transliterator. Bookmark the permalink. This is the eighth weekly installment featuring highlights from the 20 chapters in the new book, Deaf Eyes on Interpreting, edited by Thomas K. Holcomb and David H. Smith, which is scheduled to be released in June by Gallaudet University Press. As Leala Holcomb discusses in the clip above, although information sharing has always been an important feature of Deaf Culture, it is no longer restricted to in-person discussions at Deaf clubs or schools. The emergence of social media has created an important source of support and information that can counteract widespread negative messages and encourage shared strategies for overcoming discriminatory barriers. As the only doctoral student in a university setting, Holcomb gives the example of a common discriminatory practice, the dreaded two-week advance notice requirement that prevents Deaf students from participating in impromptu meetings arranged by their professors. This advance notice requirement is illegal as this two-week advance notice requirement for such meetings is not expected of any other students on campus. Leala also challenges interpreters to be more aware of unconscious oppressive behavior on their part and the policies imposed by the Disabled Student offices and urges them to learn directly from Deaf people’s experiences by following them on social media. Posted in ASL, Deaf Culture in Action, Deaf Culture Values, Deaf Eyes on Interpreting, information sharing, interpreters, New book, New book, Deaf Eyes on Interpreting, personal narratives, social media, videos from book contributors and tagged ASL interpreters, Deaf Eyes on Interpreting, Empowerment, Leala Holcomb, social media. Bookmark the permalink. 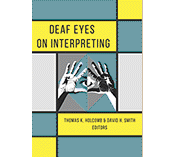 This is the seventh weekly installment featuring highlights from the 20 chapters in the new book, Deaf Eyes on Interpreting, edited by Thomas K. Holcomb and David H. Smith, which is scheduled to be released in June by Gallaudet University Press. This chapter, “Whose Reputation is at Stake?” was co-written by Tara Holcomb and Aracelia Aguilar. As Tara Holcomb describes in the video clip, this chapter stems from experiences that the two women had while attending a large professional training with participants from all over the country. Holcomb and Aguilar experienced frustration while trying to participate fully in this conference when they realized that they and the local interpreters hired to work with them had very different ideas about what constituted appropriate behavior. They explain the steps they took to take back the control of the situation so that they could present themselves as capable Deaf professionals that they are. Posted in ASL, Deaf Eyes on Interpreting, Deaf Professionals, interpreters, New book, New book, Deaf Eyes on Interpreting, personal narratives, Uncategorized and tagged american sign language, Aracelia Aguilar, ASL interpreters, Deaf Culture, Deaf Eyes on Interpreting, Deaf Professionals, Tara Holcomb. Bookmark the permalink. This is the sixth weekly installment featuring highlights from the 20 chapters in the new book, Deaf Eyes on Interpreting, edited by Thomas K. Holcomb and David H. Smith which is scheduled to be released in June by Gallaudet University Press. This chapter, “ASL Head Movements: Critical Features in Interpretation,” was co- written by Keith Cagle, Sharon Lott, and Phyllis Wilcox. Can a simple nod or shake of the head contribute to misunderstanding of interpreted messages? Yes! As Sharon Lott explains in the video clip above, head movements are an essential prosodic feature of ASL, but ASL curricula typically do not devote much attention to their study. 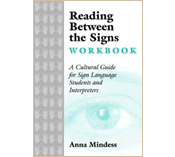 The authors contend that interpreters need to understand the different roles and functions of head movements in ASL in order to do their work effectively. Otherwise, Deaf people will continue to be confused by their interpreted messages. Posted in ASL, Deaf Culture, Deaf Eyes on Interpreting, Features of ASL, New book, New book, Deaf Eyes on Interpreting, videos from book contributors and tagged american sign language, ASL, ASL interpreters, Deaf Culture, Deaf Eyes on Interpreting, Grammatical Features of ASL, Head Movements in ASL, Keith Cagle, Phyllis Wilcox, Sharon Lott. Bookmark the permalink. This is the fifth weekly installment featuring highlights from the 20 chapters in the new book, Deaf Eyes on Interpreting, edited by Thomas K. Holcomb and David H. Smith which is scheduled to be released in June by Gallaudet University Press. This chapter, “The Heart of Interpreting from Deaf Perspectives” was written by Kim Kurz and Joseph Hill. 1) A lack of bilingual skills (English and ASL) among interpreters 2) A less than effective use of fingerspelling to support the Deaf professionals 3) Skill in employing the elements of depiction in ASL, such as the use of space, classifiers, constructed action, and role shifting were found to be sorely lacking among many interpreters. These areas of concern, the authors feel, may be due to changes in the formation of interpreters from traditional cultural immersion to more emphasis on academic settings. Posted in Deaf Culture, Deaf Eyes on Interpreting, Deaf Professionals, New book, New book, Deaf Eyes on Interpreting, videos from book contributors and tagged american sign language, ASL, ASL interpreters, Deaf Culture, Deaf Eyes on Interpreting, Deaf Professionals, Deaf-heart, Joseph Hill, Kim Kurz. Bookmark the permalink.